This DVD set has not only all the Stooges shorts but also the two-reelers of Shemp Howard, Joe Besser and Joe DeRita! 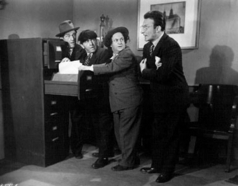 It's a fantastic set of Stooge material AND it's the first release of non-Stooge shorts since, well, a very long time! In HOLD THAT LION, Emil enacts the role of a very straight-laced lawyer, trying to help the Three Stooges claim a huge inheritance. This role is a rare case where Emil doesn't take any falls, slams, or hard knocks -- not even a seltzer bottle to the face. He does however flub his first line, which happens to be the film's opening line. Watch for it in the YouTube clip at the bottom of this page. Slight goofs like this sometimes made the final cut at Columbia Pictures' Short-Subjects Department. A day (very short one) with the Stooges! 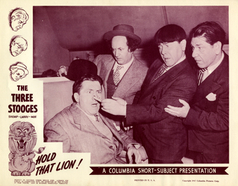 When he showed up for HOLD THAT LION, his second film with The Three Stooges, Emil was in for several surprises. First of all, Curly was not there. 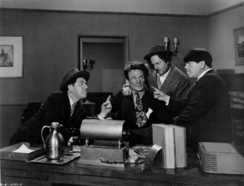 Emil knew from working with The Three Stooges previously that Moe and Curly were brothers, and Emil had been present when Curly had a stroke on the set of HALF-WITS HOLIDAY. He was not aware that Curly was forced into retirement and had been replaced in the trio's line-up, however. On the other hand, Emil had already met Shemp Howard while working in two other movies by the time he was called for this one, but he had no idea that Shemp Howard was related to Moe and Curly Howard of the Three Stooges. Thus, it was a complete surprise when he arrived on the set for another "Stooge comedy" only to find Shemp filling in as the third Stooge - and no sign of Curly. When Shemp found out there was a lion on the set, he nearly panicked. At first I thought he was joking, but he wasn't. The lion's teeth had been removed, and it was old and sickly-looking, with flies buzzing around its head. Sometimes it fell asleep in the middle of a take. 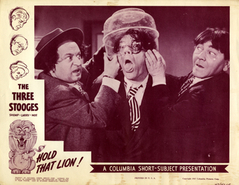 But Shemp wouldn't work in the same scene with the lion, so the director had a large plate of glass put between the lion and the Stooges while shooting. Even then, Shemp was almost mesmerized with fear, and when filming ended he was first to rush off. 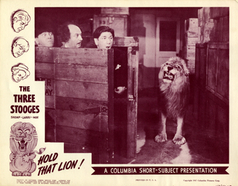 After they finished the scene with the lion and their fears were allayed, the Stooges rested themselves in a dark section of the studio. At one point, the animal trainer came looking for the lion to film another scene. While sitting in a canvas chair, Shemp was startled to find the trainer awakening the lion directly behind him. It was curled up asleep on the floor right behind Shemp's chair! 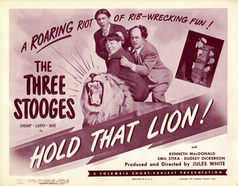 HOLD THAT LION is notable as the only film in which all three Howard brothers appear together. That would be Moe, Shemp and Jerome "Curly" Howard, of course. 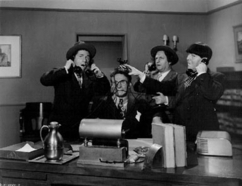 This occurs when the Stooges, including Shemp, are making their way through a train car looking for a disguised man. When they see a fellow with his hat down over his face, they are suspicious. But lifting the hat, they see he's asleep with a large clothespin on his nose. It's not readily apparent at first because he has hair, but this is Curly Howard in his last film appearance. When Moe removes the clothespin from the man's nose, he begins snoring and yapping like a dog. Moe replaces the clothespin and the Stooges move on. I wasn't there when they shot that scene but everybody said that he absolutely could not read lines anymore. He couldn't handle anything like he did before. It was a wonder that he even did that little bit. I don't know how bad he was but he must've been. Just as Curly's Stooge career was ending, Emil's was gathering momentum. 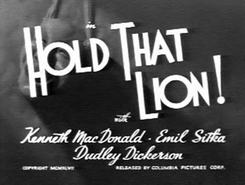 Although the role in HOLD THAT LION was actually shorter and had fewer lines than his first role with the Stooges as "Sappington the butler" in HALF-WITS HOLIDAY (1946), Emil's name was nevertheless listed this time in the film credits, both on-screen and on the lobby title card. And the movie poster has Emil's name and and an inset photo of him with the Stooges. Emil was often surprised by film credits, as he was in this case. Sometimes it seemed the smaller roles earned him film credit while larger roles would go un-credited. Always, for a role, I was tailored for a complete suit & change of suits in the Wardrobe Dept. I noticed that, for instance, in one picture I wore a black suit w/thin white stripes (as a lawyer) and the sewed-in tag was marked in indelible ink "Humphrey Bogart." Some time later, during the making of another film, I am in the Wardrobe Dept finishing up measurements for another role, and as I'm leaving I notice I am directly behind H. Bogart, all dressed up & departing for the set of "Harder They Fall." In full make-up and wearing his wardrobe I sidle up to him -- and as we exchange conversation I ask to see his inside tag. Sure enough, now he is wearing "my suit."